“This is why I tell you: Don’t worry about your life, what you will eat or what you will drink; or about your body, what you will wear. Isn’t life more than food and the body more than clothing? Look at the birds of the sky: They don’t sow or reap or gather into barns, yet your heavenly Father feeds them. Aren’t you worth more than they?" (Matthew 6:25-26, HCSB). We came across some birds on our morning walk. For some reason, they weren't scared by our presence, but continued on with their working chatter, flying back and forth, and showing off their beautiful yellow bellies. Little E and I stood there for several minutes, quietly watching them at work. Perhaps they were making a nest, or simply perching there, enjoying the early morning sun. Because we live in a part of the world without many trees, birds are an exciting rarity. There is little food out here on this open, relatively barren land. (Far different from my child-hood home out East). No, here, any trees were intentionally planted. Those trees that are in place have to be watered, day-in and day-out, to fight against the dry climate. And yet, these birds don't seem worried about the dry land in which they perch. No, for today, they've found a safe haven in a tree. They're perfectly happy, singing away in the sunshine. I, too, have a home in which to live. It's warm, it's cozy, and it's filled with so many "things" that I don't even necessarily "need." 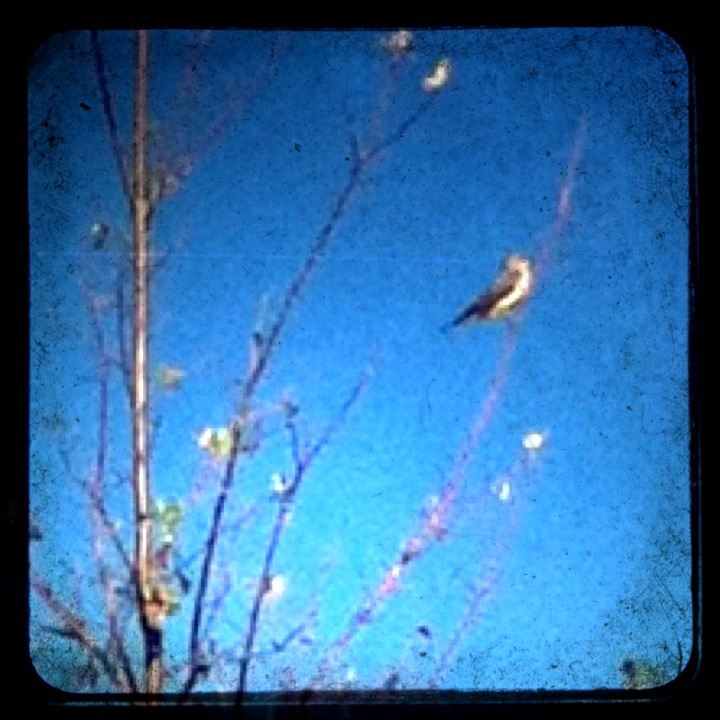 I am surely blessed, day in an day out, far more than those little birds I met on our walk this morning. Yes, there will always be things to worry about, but there isn't anything out of my God's control. And so, I'm off to sit on my back porch and enjoy some sun. Maybe I'll come across another bird or two. Aren't they amazing reminders of God's protection and love for each of us?